Steven Roberts happily makes a living simultaneously punching keys on a word processor and pedaling his custom-built 8-foot bicycle. 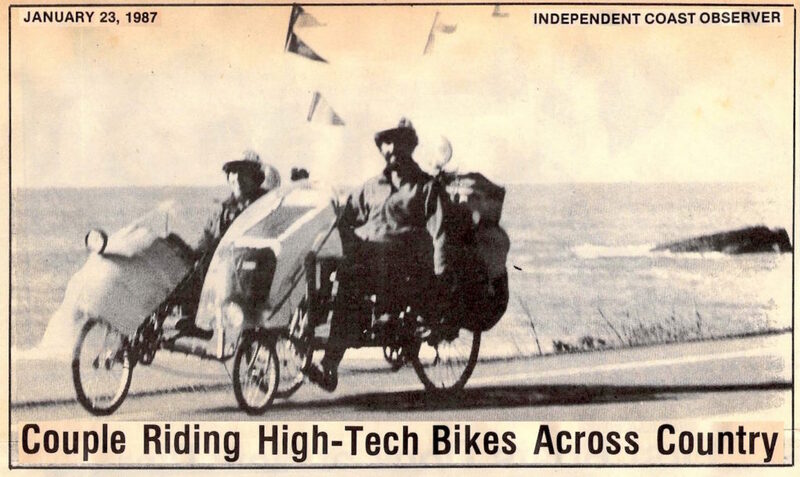 Self-proclaimed “high-tech nomads,” Roberts and his friend Maggie Victor, riding a similar bike, pedaled down the coast last week on their way from Seattle. The 33-year-old former owner of a computer engineering firm has equipped his bike with solar panels to power five microprocessers, a citizens band radio and a ham radio with an “auto-patch” radio telephone. 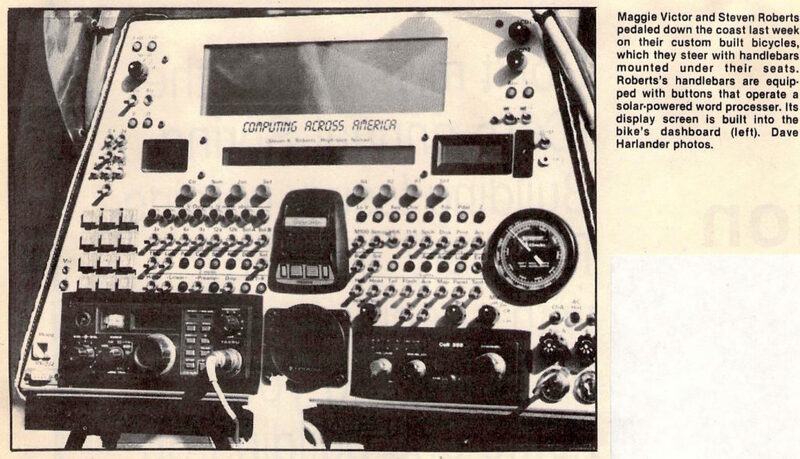 Another microprocessor is used for the word processor connected to the handlebars, which are mounted just below the seat. Built into the underside of each handle are four buttons, and by pressing them in different sequences, Roberts can create all the functions of a typewriter keyboard. The bike’s dashboard, which looks designed for space flight, has a screen that displays what he writes and a memory bank. Roberts transfers his prose from the memory to a Hewlett-Packard portable computer and, using a modem, sends stories and a weekly column to GEnie, an international computer network. Roberts said his royalties are based on “connect time” and are wired to him from his office in Columbus, Ohio. “It doesn’t matter where I am at all,” he said, because his home is his bike, the great expanse of America and the GEnie network. The two cyclists have no set itinerary, but their portable computer has a “hospitality database of extended invitations,” a list of more than 2,000 people in this and other countries who have offered them a place to stay. “We have someone’s address in Zimbabwe,” Victor said. The couple said they plan to tour the states, Canada, Europe and Russia. Roberts had been writing articles for computer journals from his desk in the suburbs of Columbus when he decided to embark on his present lifestyle. In late 1983 he started on a journey of about 10,000 miles through the southern states and up to San Francisco. He then took a year off from traveling to write Computing Across America, which is scheduled to be published this fall. Roberts was back in Columbus making adjustments to his bike when he met Victor. “He asked me two weeks after we met each other, ‘Do you want to go on a bike ride? '” she said. “We’re still on our first date.” The two put their bikes in a van and drove to Vancouver to display them at Expo ’86. The Winnebiko has various packs and saddlebags with a total 136 feet of zippers. When fully loaded with gear it weighs 220 pounds. Roberts’s weight makes it 400 pounds. To handle that load, the bike has 36 gears and disc brakes and will soon have hydraulic brakes, he said. And Roberts once overheard one bystander explaining to another that the bike is designed with a small wheel in front and a large wheel in back so that the rider is always pedaling downhill.